Still in preliminary design phase- the idea is a somewhat rough and mismatched shack, obviously hand-built and rather aged. 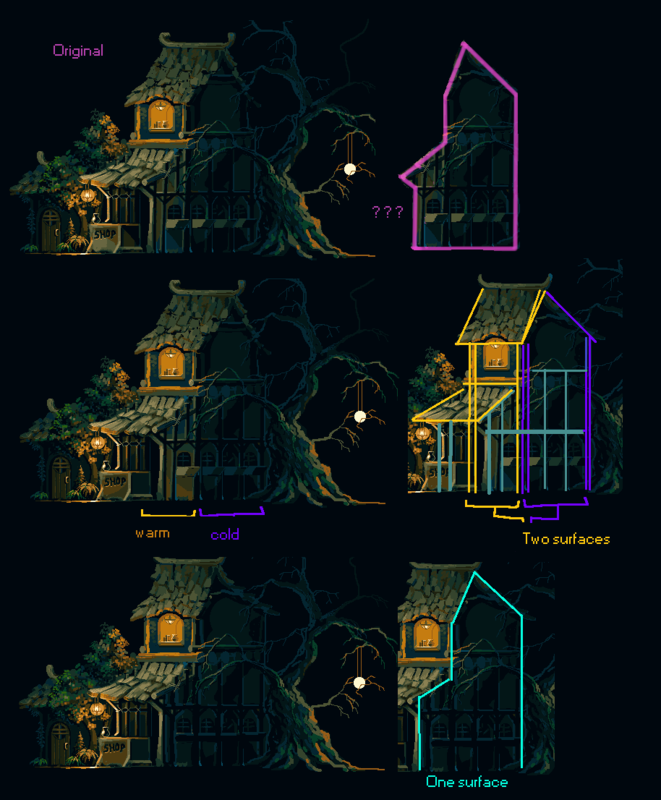 I'm pretty satisfied with the left side of the house, but the half of the house with a cast-shadow from the leafless tree is really very empty in comparison. Any ideas what I can do there to liven up the composition a little? I'm considering such things as fireflies or complicated creeping vines crawling up the side of the house. Ummm... The Moon at the top right corner, may be? It would create both lights and shades. I don't think the light to the right is ment to be the moon, but more of a lantern sort of thing? I think the right sides looks good and gives a nice contrast to the left. What's missing and making it look a bit weird is that it got no background. or a porch in the back that casts some light to the background. Any would work and give balance. @coffee: I think Agent00X was suggesting that Drazelic should put a moon in the upper right corner. He wasn't confusing the round lantern as actually being the moon. For what it's worth, I agree with Agent00X that it would be interesting with moonlight creating two multiple light sources with different hues. It's a lot of work to pull off, but so lovely when done right in scenes like this. 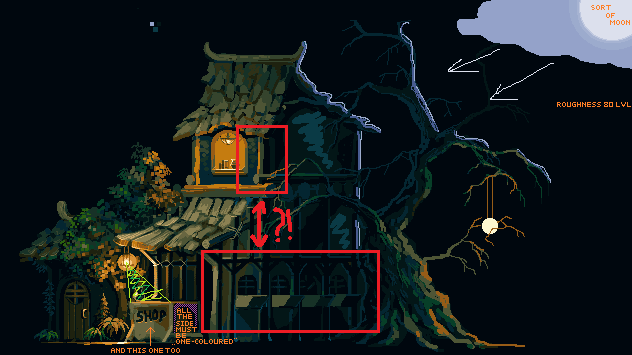 Personally, I'm having a lot of trouble making sense of the house's structure. I get that the angles and lines aren't straight because it's hand built and aged, but I just don't see how everything fits together. It's wonderfully rendered, it looks beautiful, but... it's like looking at M C Escher, in my eyes. On the top floor, it's easy to identify the closest corner of the building. But on the ground floor, I can't quite see any corners. Only the "canopy" seems disconnected from the surface of the four windows. (I assume I'm seeing this wrong, because given the corner on the top floor, the left-most of the four windows is probably on a different surface than the other three. Could be that I'm just looking at this all wrong. If no one else agrees, then that is probably the case. I'm also curious about the way you've used those diagonal lines on the 'Shop' crate. Shouldn't those go from bottom left to top right instead? I'm asking out of ignorance. "Liven up"? This already looks pretty alive to me I'd love to see what context this is in. Desperately needs a background. Fireflies sounds good, too. In case you animate those, how about rustling leaves and shaking branches? In all seriousness though, I think there are quite a few fundamental issues with your image. 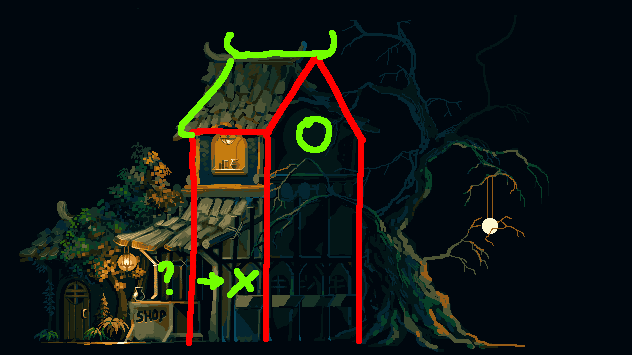 -The green X is shows a window which is drawn as though on the side of the building which is physically impossible. -The green arrow is meant to indicate that the doorway should be moved to the right so that it's in line with the front of the building. -The green circle is just highlighting a space where I think there should be an object of interest. It could be anything from a boarded up window to a sign. -Finally, although you want the house to look crudely made, I think the support beam at the top of the roof should still be (close to) centred between the two slopes of the roof rather than pushed as far forward as you have it now. E: Picture in the original post has been updated a little. Faceless, cels: This is the framework of the house in my mind. I might take that advice on making the roof of the house a bit more rigid, but otherwise I sort of want to keep the porch jutting out from the front. Crow: There's really not a context for this piece, in case you were hoping this was just a component of a larger game project or something. I couldn't get to sleep last night, so I just stayed up and started doodling and four hours later I found myself with a neat-looking house scene. coffee: Yeah, a background would be pretty nice, except for the fact that I'm not sure how to begin approaching one from this completely side-view-on perspective. Does anybody have some reference pieces they could link me? Some thoughts in a picture. Everything is already said, but pay attention to the sides of the box - they have phantom lights and shades. The criticism wasn't about the porch jutting out from the front. It's a lovely little porch. But it's more about the connection between the light sources, the walls and the timber structure which looks like a mix between English timber framing and some sort of wooden exo-skeletal framework not connected to the walls themselves. Some places it looks like part of the structure, other places it looks disconnected, and it's hard to see where it's one or the other. If you want the side of the porch to be on the same surface as the walls, then the colours and lighting should match accordingly. Maybe my edit can explain better than my words. Third version is what matches the framework you just illustrated. It feels a bit... noisy, though. Maybe I should go back in and erase some of the brick-edge texture?